← Hometown Hero Isner Survives Opener Against Blake in Atlanta. Ryan Harrison Struggles to Keep His Cool Down in Atlanta. Ryan Harrison Serves in Atlanta (Gudris). Even before he stepped on court today, young American Ryan Harrison’s reputation preceded him in both positive and negative ways. On the positive side, he possesses an exciting all-court game that many love to watch. But Harrison’s other reputation as a volatile player who breaks racquets and yells obscenities at linespeople and umpires is one that doesn’t sit well with many fans who are ready to embrace Harrison as not just a breakout American star but also as a possible heir apparent to Mardy Fish and Andy Roddick as the next top U.S. player. Harrison’s second round match at the Atlanta Tennis Championships against veteran Belgian Xavier Malisse had a little bit of everything including a tiebreak, a lengthy rain delay and several moments of hothead behavior from both players that culminated in a testy exchange of words late in the third set. Malisse and Harrison exchanged breaks in the first set leading to a tiebreak that saw Harrison go down a quick 0-4. In frustration, Harrison yelled out something that the umpire thought was an obscenity, leading him to give Harrison a verbal abuse warning. After Malisse went on to win the first set tiebreak, Harrison managed to compose himself in the second set to break Malisse at 3-2 and then hold serve to close out the set 6-4. Early in the third set, dark clouds and persistent lightning suspended the match giving way to an hour and an half rain delay. When play resumed, Harrison dropped serve and dropped kicked his racquet to give Malisse a 3-1 lead and it seemed the veteran might race away with the win. But after Harrison won an extended rally to break back at 2-3, during the changeover, both men got into a testy exchange. Harrison held serve and then at 4-4, Malisse played a loose service game to give Harrison another break. Harrison then had no problem serving out the match 6-7 (3), 6-4, 6-4. Now into the quarterfinals, Harrison will next face another veteran, American Rajeev Ram. If Harrison can keep his cool, not only physically as another scorching day is expected weather wise, but also emotionally, is something U.S. tennis fans will be keeping a close eye on not only for this week, but for many months to come. (This post originally appeared on Tennis Panorama News). 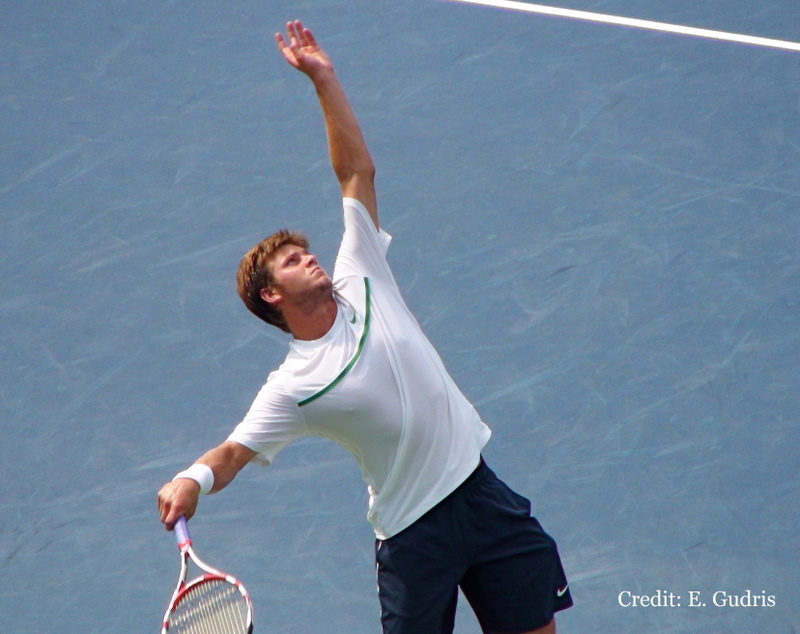 Comments Off on Ryan Harrison Struggles to Keep His Cool Down in Atlanta.